FIX-A-STITCH repair tool at the Patchwork Frog; Knitters can now easily correct mistakes in knitted fabric with this clever tool. Fix-A-Stitch is perfect for correcting garter, stockinette, seed/moss stitches and more! Knitters can now easily correct mistakes in knitted fabric with this clever tool. Fix-A-Stitch is perfect for correcting garter, stockinette, seed/moss stitches and more! Have you ever dropped a stitch and not noticed it until a row or two later? Well, for those of us who have been looking for a great tool to correct our mistakes, we now have the perfect tool available! Fix-A-Stitch is easy for all skill levels of knitters to use and is perfect for correcting garter, stockinette, seed/moss stitches and more! 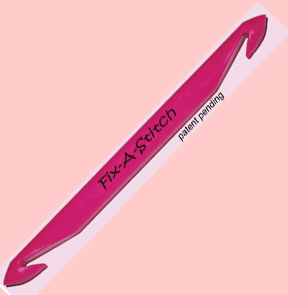 Constructed of partially recycled plastic, these little repair tools are also eco-friendly. Fix-A-Stitch™Original enables a knitter to repair garter stitch fabric as easily as stockinette … And of course it also works on seed stitch or other patterns. 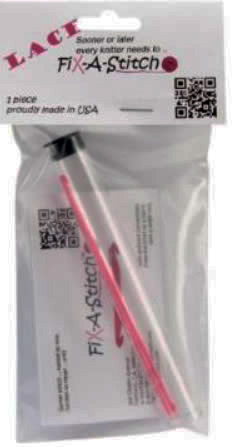 It simply allows you to knit or purl with the same tool from the front of the work with a single device.